DNA replication means doubling the DNA content of a cell, by making DNA molecules out of every DNA molecule present. Okazaki fragments: small sections of DNA found on the lagging strand. DNA replication is semi-conservative; this means that the new DNA molecules each contain 50% of the original DNA, that is – one of the original strands. The new DNA molecules each have one of the original DNA strands, and a new strand that has been synthesized from free nucleotides in the cytoplasm. -DNA unwinds and separates into two separate strands (unzips). This means that the hydrogen bonds are broken in between the base pairs. -The enzyme helicase helps to separate the two strands, and requires ATP to break the bonds. -Each of the separated original strands serves as a template for building new strands. -The new strands are formed by joining free nucleotides one by one, that are complimentary to the original strand sequence. -The enzyme DNA polymerase functions by joining nucleotides to the new strand. By joining the nucleotides one by one, fewer mistakes are made. The enzyme always joins nucleotides in the 5′-3′ direction. This first animation shows very neatly how DNA is coiled into chromosomes. The second part shows DNA replication, but at a level needed only for higher level. Watch it, focusing not on the names of the enzymes, but only on the process of forming the new strands. Watch how joining to the 3′ end causes a problem in one of the new strands. 1) When do chromosomes form, and what is the trigger for their formation? 2) Why is it necessary to form chromosomes? -The enzyme only works in 5′ to 3′ direction. This causes an interesting problem with one of the new strands. Task: Summarise in a table the role of the following enzymes and molecules: RNA primer, DNA polymerase, helicase. Task: Explain in three concise bullet points, in your own words why the lagging strand presents a problem. Meselson and Stal provided the evidence in 1958 which led the widespread acceptance of the theory of semi-conservative replication. They used isotopes of nitrogen (N-15) to create special heavy nucleotides. Because the new strands use the nucleotides from the cytoplasm, the double stranded molecule could only build the new strands from the heavier N15 nucleotides. This meant that the new strands were half light N-14, and half heavy N-15. Their weights were above the weight of the original DNA made with N-14. They measured the weights using centrifugation (a spinning test tube). 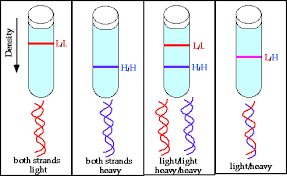 The heavier the DNA is, the more it moves down the test tube and forms a band lower down. As D occurred, the new DNA was in between the weight of the original, and the new DNA. This was evidence that the DNA was a mixture of old and new DNA (semi-conservative). Meselson and Stahl argued that the new DNA had one strand of the original DNA, and one new strand made from the light nucleotides. Controversy: some scientists argued that the new DNAs where actually a mixture of old DNA and new DNA fragments, interspersed together. This was called dispersive theory. In order to counter this claim, Meselson and Stahl allowed for one more replication cycle. The results supported their version of events. 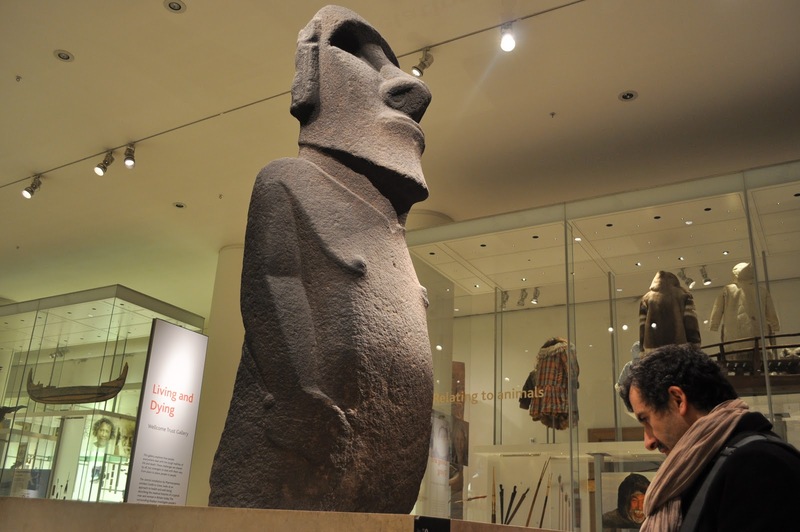 how would you make a replica of a famous object from a museum? 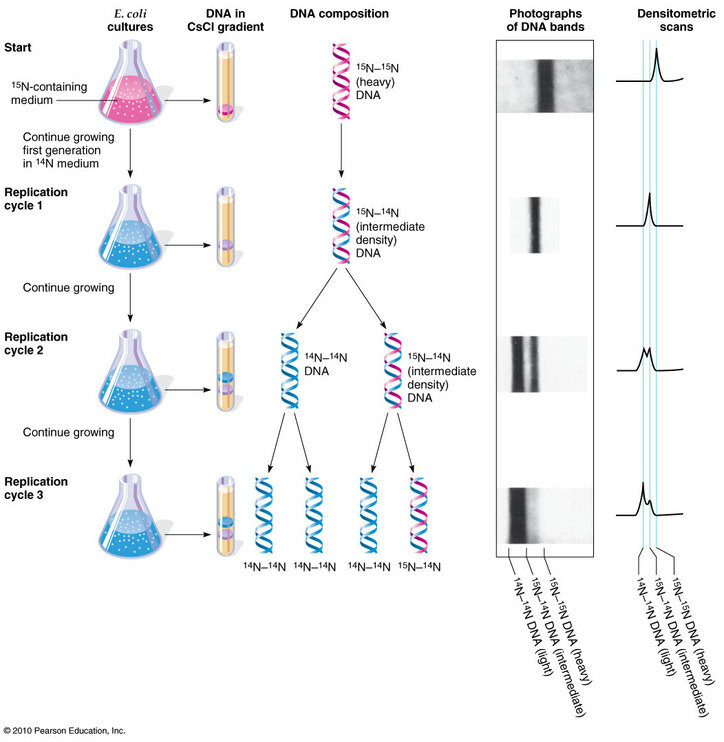 Anti-sense strand: the complimentary strand of DNA to the sense strand, used by RNA to make a copy of the sense strand. RNA polymerase moves along the anti-sense strand, adding complimentary nucleotides one at a time to form MRNA, in the direction of 5′ to 3′ of the mRNA strand. The mRNA molecules leaves the nucleus, via a nuclear pore, and enters the Rough Endoplasmic Reticulum. Why does mRNA make a complimentary copy of the anti-sense strand, as opposed to the sense strand? Why is it necessary to make a copy of the DNA in the first place? In the movie, what is represented by the blue molecule? and the yellow strand? and the red curly stranded molecule? If the sense strand included the following base triplets: ACC/GCC/TAC, what would the anti-sense strand include, and what would the mRNA codons for this section be? How does the transcription process know when to start and stop? Compare DNA replication and transcription? 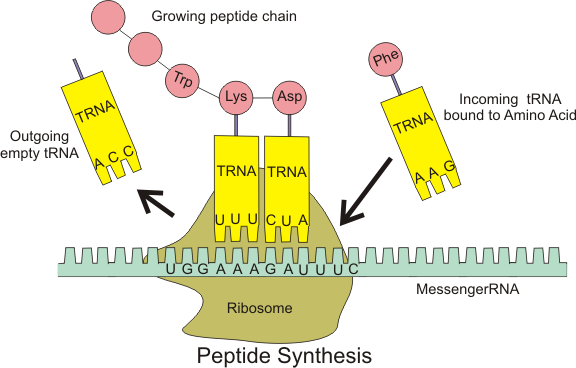 Translation is the synthesis of polypeptides on ribosomes. Proteins are made from more than one polypeptide (e.g. collagen is made from three polypeptide chains woven into a triple helix). mRNA binds to the small sub-unit of a ribosome. The first codon (triplet of bases) on the mRNA matches an anti-codon (complimentary triplet) on a tRNA molecule. The tRNA molecule with the matching anti-codon, binds to the ribosome. A second tRNA molecule bonds to the ribosome, having an anti-codon which is complimentary to the next codon in the sequence. The second tRNA brings another specific amino acid. The ribosome transfers the amino acid carried by the first tRNA to the amino acid on the second tRNA, forming a peptide bond between them. The mRNA moves along the ribosome, causing new tRNAs to bond, bringing with them new amino acids, which are added to the growing polypeptide chain. Task: Model DNA transcription and translation, make a short educational video. IN your video, make a specific amino acid sequence using the code below.